If you can relate to characters with existential insecurities — and these days, it seems like we all can — Ottessa Moshfegh's fiction will resonate. Moshfegh is a rising star in the world of literary fiction. She is a novelist and short-story writer from Boston. While still early in her career, she has already put together an impressive resume. Her first novel, "Eileen," won the PEN/Hemingway Award for debut fiction and was short-listed for the National Book Critics Circle Award and the Man Booker Prize. And now, she has recently released her first short-story collection, called "Homesick for Another World." Doug Gordon: Your new book of short stories has a great title: "Homesick For Another World." I'm curious. Are you yourself "homesick for another world"? 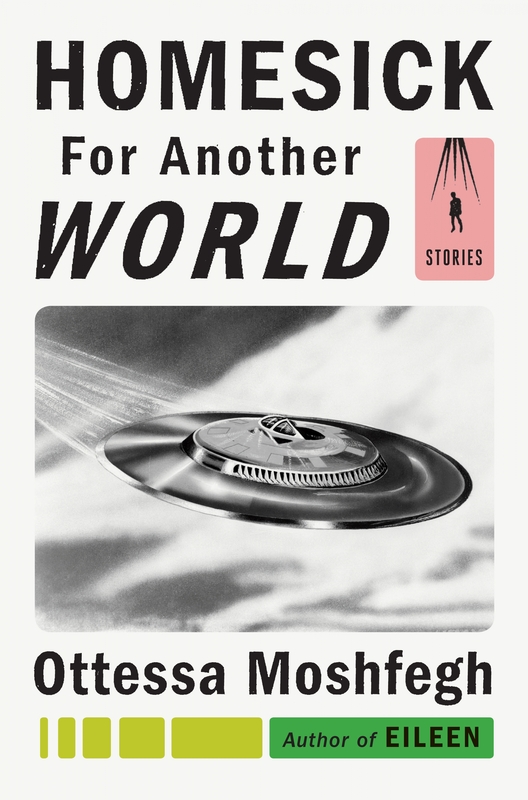 Ottessa Moshfegh: Am I homesick for another world? Yeah, I think we all are in multiple ways. The title comes from the last story in the collection, a story called "A Better Place." And I took the title from that story because that story feels the most personal to me, actually. There isn't any satire in it, in the way that I use satire, I think in most of the other stories in the collection. And it's written in a different register and it is dealing with a kind of spiritual quandary or perhaps a misinterpretation of what life and death are in a way that I think all of the characters in the book experience. But this character from the story, "A Better Place," felt the most like me in her attitudes. So. it felt natural to pick the title from that story. And that she is homesick for another world, kind of describes the general attitude I had toward this book, what I wanted this collection to be about. DG: This is the last story in the book. Was it the last story you wrote for the book? OM: It was. It's funny, I didn't expect this to happen. I didn't know that when I finished the story that I would have been done with the book. But it felt so completely over by the time that story was over that, in fact, I felt, and continue to feel, like I don't need to write another short story for at least several more years. And that was kind of a terrifying experience because the short story form had been really my thing since I had started writing. So. yeah, it was peculiar. DG: So if you don't mind my asking, what kinds of emotions were you experiencing while you were writing this story? OM: This story came out of me in a weird, rare way. I barely edited it. It came out as though it was being transmitted by some other force ... It's almost like you just sit down and it happens. So, I was kind of just watching it and vibrating with it and writing it. And feeling a lot of things. I felt really moved by it. It saddened me, this question of not wanting to be in the world, but also not wanting to leave the people and things and places that you love in this world. This feeling of, I think we're all feeling a version of this, watching what's happening in the world, which is suddenly extremely undeniable, that things are kind of scary and not that wonderful in many ways. And we want, I think a lot of the people I talk to, a lot of my friends are saying I want out, but I don't know where to go. And it's that thing of this is my world, "How come it's so hard here?" and "I want that version of the world that I felt safe and comfortable and right in." But then all of these problems here are tied to things that I love too and we can't really have it both ways. DG: Yeah, that's true. How much of this homesickness for another world has to do with the fact that your mother is from Croatia and that your father is from Iran? OM: Well, it's a complicated question because I'm not from those places, you know. DG: Yeah, you were born in Massachusetts. OM: Yeah, I was born in Boston. I've never been to Iran. I don't identify as an Iranian at all. I don't feel particularly Croatian although I think it's a really beautiful country and I still have an uncle who lives in Zagreb ... At the same time, I can't say that I feel particularly American in the way that we can talk about Americanness. But I don't know where else I would belong, you know. I'm from the Northeast. When I'm mining my imagination for places, I refer quite often to New England. I've written two novels now set in New England. A lot of the short stories are set in the northeast United States. And a novel that's coming out next summer is set in New York City. That part of the country is where I'm from, it is in a way my homeland, but I don't particularly care to identify with it. I don't know if that’s just the kind of personality I have or that thing of I don't want to be part of a club that would have me kind of attitude. I'm kind of a floater. For most of my young adult and adult life, I've moved every two years. DG: Your characters are so fascinating. They have these existential insecurities, insecurities that I can really relate to. Yet at the same time, they're trying to, despite these insecurities, they're trying to connect with other people and to better themselves. And I couldn't help but notice that the first story is called "Bettering Myself" and the last story is called "A Better Place." So, if you don't mind my asking, how much of your characters' existential insecurities come from your own life. OM: All of them. A hundred and 10 percent. Yeah. I mean I don't have the answers. I mean, in some ways I'm asking these questions of my characters. Like "Is this going to be the story where at the end I've figured out my own existence?" Inevitably no, but maybe I've gotten a little closer to what my life is supposed to be, you know? DG: And if you did figure out your own existence, if you did write a story that you thought, "Hey, Eureka, I've figured out my own existence," would that mean possibly, potentially that you would stop writing? OM: Yeah, probably. But I also think I would just disappear in a puff of smoke if that happened. DG: I read this story … in which you talk about this video performed by a singer named Lena Zavaroni and her cover version of a Neil Sedaka song called "Going Nowhere." The response you had and the things you said about it were very intriguing and provocative. Can you tell me about this video and why it means so much to you? OM: Well, "Going Nowhere" is, first of all, an amazing song. And the more I hear it, the more relevant it feels in its lyrics and this description of where we feel we're headed as individuals or as a society, generation after generation. But at the same time, it's a really heartfelt and sweet song. It's not a political song in the way that one might expect a song about the fallout of humanity to be. I was so moved by the performance because the singer, Lena Zavaroni, is this really small, delicate creature that possesses this insanely powerful voice. And in this performance of "Going Nowhere," it seems like she is being possessed by a spirit. Her expression changes as the musical introduction begins. You can see her kind of getting into the state, she looks like she's in a trance. And her performance is so intense, it's like her life force being expressed directly to you. And it's a powerful life force and it's a message that feels non-intellectual in a way that just resonates really powerfully with me, like in my body. I understand this feeling of being lost, almost like in outer space. But knowing yourself and being fiercely determined to be alive. And I really related to her and just respected and admired her so much for this vulnerability and strength and deep unheard-of wisdom in the way that she transforms this song. DG: There was a really interesting part in this story where you said that writing saved your life. Can you talk a bit about how writing saved your life? OM: I think it saved my life in a way that it protected me from self-desertion at a young age. But it also, I think, protected who I was and that I could have an identity that was singular, I could have a relationship with myself through my creativity, and it had nothing to do with what anybody else was telling me. The messages I was getting from the world were mostly negative or I was interpreting them as negative. So, I could build an "Otessaland," you know, out of my imagination and in that be productive and feel like my life is good for something.